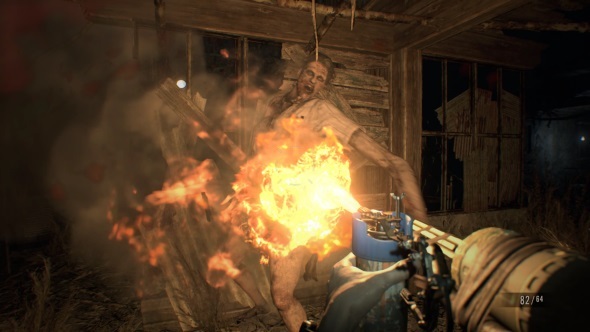 Not too far into Resident Evil 7 you’re confronted by possibly the most grisly, disturbing sight in modern videogames: a battle involving a part of the female anatomy that’s playing host to a beehive. That’s caught your horrified attention, hasn’t it? If you think you’re grossed out now, wait until you actually play it. As awful as the concept is, it contributes to a very important new shift for the series: finally, Resi is horrific again. Gone is the action movie bravado, building-collapsing explosions, and a briefcase full of rocket launchers. With the seventh entry in the core series, we’re returning back to the world of creepy houses, lock puzzles, and back-tracking. Stay terrified with the spookiest horror games on PC. 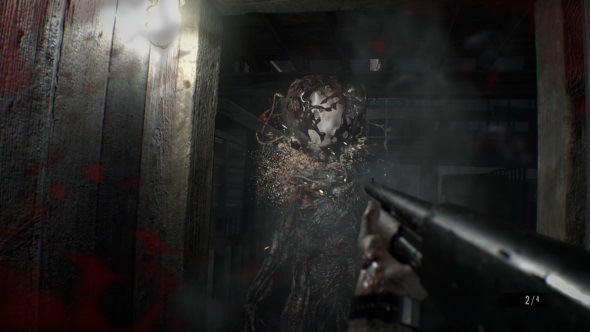 From the outside, Resident Evil 7 doesn’t look like a Resi game. There’s no Chris Redfield or Ada Wong, no zombies, nor a secret underground lab. Instead it’s the story of an unknown guy called Ethan Winters (dressed simply in a shirt and brown leather shoes, would you believe), trying to free his wife from the clutches of a psychopathic family in the deep south of America. The family in question are the Bakers, and the game takes place on their property. The bulk of the real estate is taken up by their house; an echoey, labyrinthine mansion with huge staircases, forgotten rooms, and a lifetime of hoarded trinkets. Your introduction to Jack, Marguerite, and their son Lucas comes via an already infamous family dinner scene, and from then on you’ll have to deal with these terrifying people as you journey through the rooms and surrounding buildings of the estate. In many ways Resident Evil 7 looks like the vogue indie horror games of the last few years. The grounded, realistic setting evokes Amnesia and Outlast, and it’s the first game in the series to use a first person view instead of third. If this makes you feel like Resi has completely lost its identity, that’s very understandable. The good news, though, is it hasn’t: this is a Resident Evil game through and through. Any fan will instantly be able to draw comparisons between the Baker’s house and the mansion from the original 1996 game, and not just because they’re both domestic residences. It’s a small environment that you’ll spend a lot of time walking around as you unlock its secrets, back-tracking to rooms you’ve been in before numerous times. 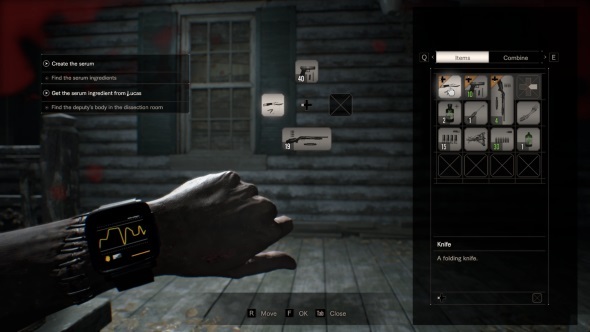 Doors lock off huge chunks of the house, and by solving puzzles you can acquire the keys required to further explore. Entering new rooms helps both further the story and arm Ethan with better weapons. If that’s not a classic Resident Evil structure, I don’t know what is. As a puzzle game it’s not quite as fiendish as the Resi games of old. You’ll be rotating items to find hidden clues like the older titles had you doing, but you’ll very rarely find them mentally taxing. That’s a positive; the pace is very rarely stunted by you being stuck in a room attempting to work out an obtuse lock. They also ebb and flow with the plot. The game contains plenty of extended quiet moments as you attempt to collect items, but the game isn’t afraid to force you to stick your arm down a man’s bloody throat in its more heart-pounding moments. The game partially tells its story through the use of VHS cassettes. Baffling choice of media aside, these videos show the Bakers doing horrific things to people in the mansion before your arrival. And they’re not just cinematics; you’ll be in control of these other victims. In terms of horror, it’s a clever way to do something truly horrendous without endangering the main character. Most impressively, these sections provide brilliant foreshadowing. They’re essentially training grounds for moments that you’ll have to endure later, equipping you with the knowledge of how to survive. You playing the same area twice, but come to it the second time with a sense of empowerment. At least, as much empowerment as you can get in a game dripping with dread. And when I say ‘dripping with dread’, I do mean that literally. Many areas of the estate are covered in a sticky goo-like substance, from which monsters grow. The Bakers may be the main threat in Resident Evil 7, but these mould monsters are what make up the bulk of your combat adversaries. Around half your playtime will be spent in areas where you have to fight them, making it a little more combat-heavy than the oldest games, but certainly several notches below the action-focused formula the fourth title introduced. In the opening hours combat is terrifying; armed with just a knife, encounters with the creatures make you feel helpless and hunted. Finding a pistol helps relieve the stress, but it’s when you get the shotgun that the fear levels of the game really shift. The pump-action is incredibly powerful, and a close range headshot will decapitate foes for good. Provided you pay careful attention to your ammo, you can easily shoot your way through the game’s standard enemies. This does have the unfortunate effect of making the shooting feel a bit rote, especially in the last third of the game where ammo is plentiful. Thankfully the continued quality that runs through every other element ensures that the overall experience isn’t spoilt. The thick atmosphere, heightened by brilliant sound design and lighting, helps keep you on your toes even in times when the combat fails to provide the danger. Another heritage badge this entry wears is inventory management, with a very small slot-based system that evokes the earliest games in the series. Save point rooms contain a big lockbox that you can store your collected wares in, but you’re restricted to carrying around a dozen items. There are a couple of backpacks to find in the house that expand your inventory, but at any size a degree of forward planning is required. What weapons will you need? Are health potions more important than extra ammo? What keys are required? And don’t forget to leave some slots free so you can pick up new things. You can ‘drop’ items, but they’re lost forever, so it’s a last resort option. The inventory system also includes some very basic crafting. You can combine raw materials like gunpowder and herbs with a generic ‘chemical’ to produce items like bullets and medicine. It’s an incredibly simple ‘use x with y’ system, but considering the inventory doesn’t pause the game, stopping to try and make things in the midst of battle can aid in creating the panic that the series is so well known for. Throughout all your actions in the house, the tension and fear is all built up by the Bakers themselves. They’re the best decision Capcom have made; by introducing them at the very start of the game, they instantly instil horror in you, and there’s a continual sense of dread through the game because you know that you’ll eventually have to face them again. Each family member acts as the boss in a different area of the house. How you go about defeating them varies greatly; one of them is even felled via a puzzle-based solution rather than bested in combat. There’s a touch of Alien: Isolation at play in the earliest hours as the imposing Jack stalks the corridors, and keeping out of sight is the only way to stay alive. The game doesn’t stick with that structure though, which is both to its benefit and detriment. 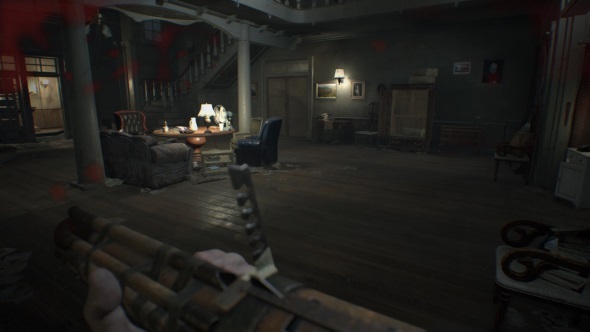 Overall it feels distinctly like a Resident Evil game with prescribed areas for enemies and jump scares, but I feel it could have offered some great dynamic horror by having the family members as persistent threats that could be in any room you walk into. This is not Alien: Isolation, though. Nor is it Outlast or Amnesia. And as much as it wears those western influences proudly (as well as the grisly aesthetic of films like the Evil Dead remake and The Devil’s Rejects), it’s absolutely a Resident Evil game. This isn’t a game about hiding and sneaking by enemies with your breath held. You need to be cautious, sure, but you’re also going to put seven shells of buckshot in evil’s head and make sure they’re dead for good. Or at least until Resident Evil 8. There’s more evidence than I’ve mentioned that this is indeed a true Resident Evil game, but much of that DNA is in the plot, so I won’t divulge that here. While the camp nature of the series has been replaced with a grungy, grounded flavour, there’s still a healthy dose of absurdity here. Suffice to say it has that moment at the end of act two where things get very Resident Evil, and it’s the kind of thing that will have fans crack a smile. 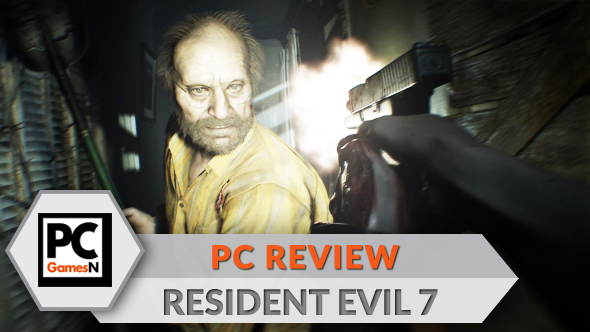 For a full breakdown of how the game performs on various hardware, check out our Resident Evil 7 PC port review.